1.Preheat oven to 400°F. Heat large covered saucepot of water to boiling over high heat; add broccolini and cook 2 minutes. With tongs, transfer broccolini to bowl with ice water. Once cool, drain broccolini and pat dry. 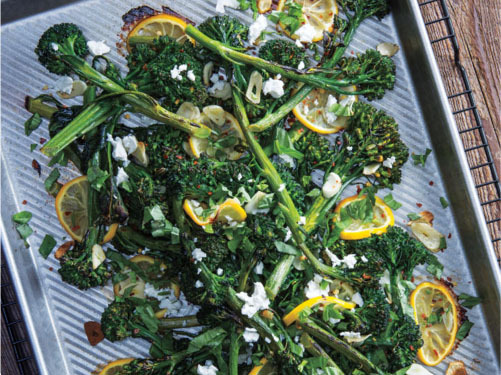 2.In large bowl, toss broccolini, garlic, lemon, oil and salt; spread in single layer on rimmed baking pan. Roast broccolini 20 minutes or just until tender-crisp. 3.Sprinkle broccolini with cheese, basil and red pepper, if desired. Serve immediately.